How do I block my FB account permanently or deactivate Facebook temporarily? : Here, you will find how to block your Facebook account permanently or deactivate your FB account temporarily. We are here to assist you!!! Deactivating or blocking Facebook permanently is an option you have to choose from when you want to leave Facebook. 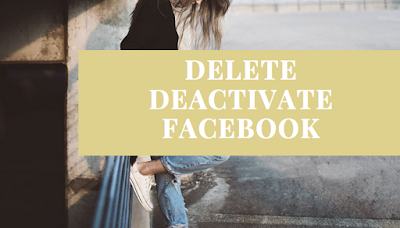 If you choose to deactivate your FB account, the door to recover your Facebook account is always open but be careful if you choose to block your Facebook account permanently you will not be given the chance to regain or recover any information from your account. If you have made up your mind to permanently block out your account, then you must download and backup a copy of your data from Facebook. Facebook makes it plain and clear that it will take 90 days for Facebook to completely delete all photos, videos, posts, likes, comments, messages, and everything else concerning your account off from Facebook. Other Facebook users including your friends won’t be able to visit your profile during the deletion process. Keep in mind that the text messages, images you’ve sent to your friends via chat will reside at their end because they’re a part of their account also. If you don't want to keep such message(s) or photos, You can ask them to take it down. They'll like to respect your privacy!!! Facebook is the biggest social network in the world with over 2 billion active users. Sometimes you want to get out of your Facebook life and enjoy the real world. You do this by deactivating your Facebook account. But you can also delete your Facebook account permanently if you want to leave Facebook for the rest of your life. If you have any qualms deleting or deactivating your FB account, do let us know via the comment box.